When I started to think on this book, I remembered somenthing that happened me when I was a little child. I went toghether with my parents to pay a visit to some relatives who lived in a village 30 km from salamanca. They had some hares in a wooden box. My uncle questioned me If I would like to have one. I said yes very happy. Asked me to choose one and I did it. I chose the one I founded more intelligent and beautifull. My uncle inmediately give him a terrible hit on the neck and still half live started to take the skin of the hare off, put it on a plastic bag and gave it to me (still moving) I could not even image that a hare could be eaten and my uncle never considered that someone would have a hare as a pet. I was so shocked that even now it is impossible to me to eat hare or other similar animals wich are very common, at least in spain. I asked to my parents not to eat him but to bury him in that garden, in San francis garden, wich is an incredible coincidence. 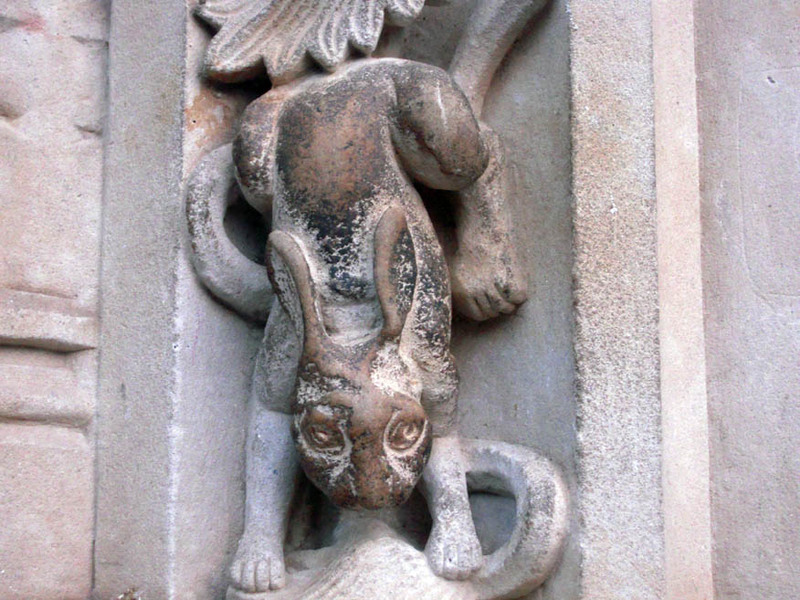 Now I folowed the clues and references carved in the stone of the churches and cathedral in salamanca (to hare and other animals, angels...). You can see. everithing is related.